The CherryBerry frozen yogurt franchise owner for Texas has apparently closed four stores in the past six months. (UnhappyFranchisee.Com)According to Corporation Wiki, John J. Shutt & Travis R. Phillips of Phillips & Shutt Holdings L.L.C. own the CherryBerry franchises in Clear Lake (Webster), Pasadena, Tomball, and Conroe, Texas. The Facebook pages of all four locations indicate that they cased operations an average of 16 months after opening. Franchisees Shutt & Phillips appear to still have operating CherryBerry locations in Lake Jackson, Pearland and Victoria, Texas. Despite the closures and evidence that the self-serve frozen yogurt market is saturated, Beautiful Brands (BBI) is aggressively selling both CherryBerry franchises and Freshberry franchises as a great business opportunity. Two months later, the Pasadena, TX location would announce that it was closing as well. CherryBerry in Pasadena, TX announced its closing on November 21, 2012, just 20 months after opening. Its Facebook page documents its life as a franchise, starting with its 2011 “Coming Soon” banner and construction photos and concluding with its 2012 farewell message. The CherryBerry franchise location in Tomball, TX appears to have closed quietly in November, 2012. According to it Facebook page, the Tomball CherryBerry opened in July, 2011. 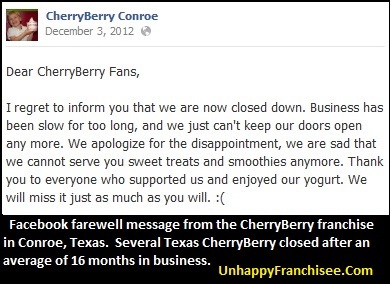 In February, 2012 CherryBerry Tomball dispelled early rumors that it had closed. In November, customers complained that it was closed, a fellow Cherryberry franchise (from Claremore, OK) asked if it was closed and another poster confirmed it. Just one month later, the CherryBerry in Claremore, OK would close as well. “Dear CherryBerry Fans, I regret to inform you that we are now closed down. Business has been slow for too long, and we just can’t keep our doors open any more. TAGS: CHERRYBERRY Texas Franchise Failures, CherryBerry, CherryBerry Frozen Yogurt, CherryBerry franchise, CherryBerry Frozen Yogurt Franchise, Froyo, Froyo franchise, Frozen Yogurt franchise, Beautiful Brands International, Dallas Jones, Robyn Jones, David Rutkauskas, franchise failures, franchise closures, franchise graveyard, Unhappy Franchisee, John Shutt, Travis Phillips of Phillips & Shutt Holdings L.L.C., Clear Lake TX CherryBerry, Pasadena TX CherryBerry, Tomball TX CherryBerry, and Conroe Texas CherryBerry.